No Impulse Control Around People. Jumps and Bites. Absolutely no impulse control around people, that is the problem. 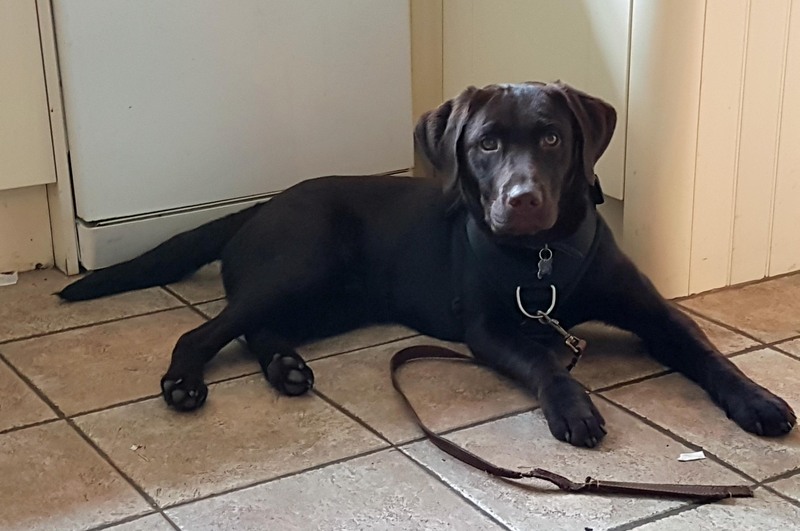 Beautiful Beau is a big strong Chocolate Labrador. He’s 9 months of age and his teeth hurt. With no impulse control, his biting and grabbing of my clothes would have been nearly constant had not the lady held him back. It was a struggle for her. I have to call it ‘biting’ because he was using his teeth with some force, but there was no aggression behind it. No growling or hostility. There wasn’t fear either though possibly the level of his arousal involved more than just pleasure to see me. He will have been uncertain as well. Jumping, biting and no impulse control has become his default response for dealing with the excitement he feels. Both the lady and her adult son are accustomed to being bitten when Beau gets too excited. He bites sufficiently hard to bruise but not to break skin. He was an unusually nippy and bitey puppy. Like many people, they will unwittingly have encouraged teeth on human flesh through play – contact sports using their hands. A stitch in time saves nine, as they say. If, from the outset when Beau was a little puppy, both jumping up and grabbing with teeth were consistently and persistently met with no reinforcement but an acceptable alternative offered, he wouldn’t be doing it now. Tug of war played properly is a much better game. Puppy has to learn that if teeth even unintentionally touch flesh, all fun immediately stops. He then learns to be careful. Usually dogs like this will have very high stress levels and constantly be ready to ‘explode’. This doesn’t seem the case with Beau. His home is calm. Generally he’s no more excited than any other 9-month-old Labrador, but when he does get aroused, it’s always teeth. Beau is given plenty of enrichment and he’s not left alone for too long. He doesn’t do the usual things that build stress in a dog such as excessive barking, getting over-excited before a walk and panicking when left alone. He has no impulse control around people. When someone comes to his house or if they meet people when out on a walk he morphs into a different dog. Why does he find people quite so stimulating, I wonder? He has been very well socialised from the start. The lady so much wants to have social walks with her lovely dog and to invite friends round, but she can’t because he bites them! Things are getting worse. Could this be that she herself is becoming increasingly anxious? As I sat with her in the kitchen, I could feel her very understandable tension and anxiety. If I could feel it, then so would Beau. Having been rehearsing the biting and jumping for months since he was a small puppy, it will now be learned behaviour – a habit. How can we break it? Learned behaviour – a habit. What we have to work on is both the cause of the behaviour as well as the behaviour itself – and this cause is over-excitement around people and no self-control when aroused. To succeed, Beau must be prevented from rehearsing the biting anymore in every way possible. It simply has to be made impossible. Without an experienced professional actually living with them with nothing else to do than work with Beau, I can see no other way than extensive use of a basket muzzle to begin with. When he gets his ‘rough’ times at home with his family, when friends visit and when he’s out and likely to encounter people, his mouth has to be taken out of action. This will be much better than banishing him. A basket muzzle is best because he has freedom open and close his mouth, to drink and to eat treats. If introduced properly so that it’s always associated with good things, he shouldn’t mind it too much. I know this could be controversial. Without now being hurt, they must now teach him different habits and better ways of getting attention. He also needs better ways of relieving his quick-building arousal and frustration levels. In removing the ability to bite from his repertoire, they need to supply replacement activities and outlets. I suggested a gate for the kitchen so at times when he’s likely to use his teeth or when people come, he can go behind it with something acceptable to chew until he has calmed down. Use of ‘No’ and ‘Down’ can only increase his frustration whilst in a way being reinforcing to him as well. When I was there, Beau held lead on harness to prevent the biting of me, we constantly used his food to reinforce every moment of desired behaviour. He sat, he got food. He lay down and was silently rolled a piece of his kibble. The emphasis must now be on reinforcing the behaviour that they DO want. People, when out, will be kept at whatever distance is necessary while they work on his self-control using positive reinforcement. He will learn that sitting or standing calmly brings dividends but this is only possible when not too close. Jumping and biting is simply Beau’s default both when aroused or when feeling unsure of himself – both at home and when out on walks. We shouldn’t underestimate the effectiveness of a dog having something in his mouth where the teeth are, whether it’s a ball, something that squeaks or even a bone! It all depends – all dogs are different. What actually is excitement anyway and is it always pure joy? Wouldn’t we feel excited on a Big Dipper? Wouldn’t we be feeling scared before a bungee jump and isn’t that part of the buzz? As Beau gains some self control and is helped to calm down around people, the muzzle can be used less and less until it’s no longer necessary. NB. For the sake of the story and for confidentiality also, this isn’t a complete ‘report’ with every detail, but I choose an angle with maybe a bit of poetic licence. The precise protocols to best use for your own dog may be different to the approaches I have worked out for Beau. Finding instructions on the internet or TV that are not tailored to your own dog can do more harm than good as the case needs to be assessed correctly. One size does not fit all so accurate assessment is important. The muzzle idea may be totally inappropriate in another case. Everything depends upon context. 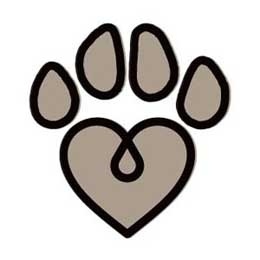 If you live in my own area I would be very pleased to help with strategies tailored to your own dog (see my Help page). Unlike so many of the dogs I go to, enthusiastic Cocker Spaniel Rudi has no reactivity problems at all towards other dogs. He’s adorable and he is adored! Rudi, 7, and has lived with the couple in their cottage in the country for eighteen months. What a lovely life he now has, with a big garden and the little two-year-old nephew the lady looks after. The two are inseparable. Far too many dogs, like the little dog whose story I posted yesterday evening, are scared and reactive to other dogs. The fact my post has already received 418 views in half a day shows how big an issue this is. Some dogs do seem to attract trouble from other dogs. Those dogs already wary undoubtedly will have ‘victim’ somehow written on them for other dogs to read. Some dogs may just be ‘different’ in some way. In human terms we often hear of people who are a bit different being victimised or bullied. It could be to do with signals the walker is giving out also. Enthusiastic Cocker Rudi is completely confident. He gets on well with all dogs. If a dog shows aggression towards him he ignores it, continuing to do his own thing which is being busy, spaniel-style. Nothing fazes him. Where they do have trouble however is with his constant restlessness. At home he jumps up and may send a cup of tea flying. He pulls so much on lead that the lady can’t walk him. A while ago someone advised a Gencon head halter, so he’s now walked on a shortish lead with pulling almost impossible. He hates it. They were even advised to tire him out with ball play in the garden before setting off. All this does is to fire him up further. Neither of these things address the actual problem. Frustration. The enthusiastic Cocker Spaniel is insufficiently fulfilled. He’s seldom able to be let off lead because when he sees a pheasant or Muntjack, there are lots where he lives, he’s off. Just imagine how frustrated this busy dog must feel, walking in the open countryside on an uncomfortable head halter and short lead. He just can’t get to all those things his instinct is screaming at him to do. 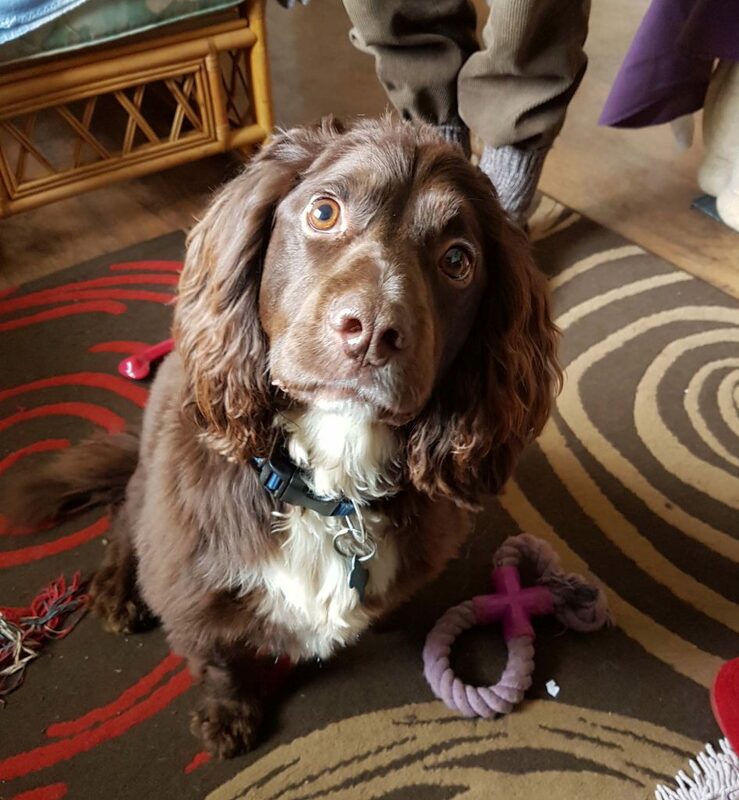 He has a strong need to run around and sniff when he’s out – he’s a Spaniel! He also has a need to chase and fetch things – he’s run run back with a live crow in the past. They will get him a Perfect Fit harness and teach him loose leash walking. The lead doesn’t have to be short unless they are near the road. Why not a long line – 30 or 40 foot long – on the back of his new harness? His walker can soon learn not to become tangled up and to be a human flexilead. The enthusiastic Cocker Spaniel can now have comfort on walks. He can have a degree of freedom to do Spaniel things. On the long line for safety, he can be taught to ‘chase’ a ball or food in the opposite direction to the pheasant or Muntjack. This can redirect his drive to chase onto something acceptable rather than suppress it. They can work hard at his recall. I am sure that with this frustration out of the equation Rudi will be able to settle a bit more easily. He should be a little less excited at the prospect of action – any action (something wired into Cockers as I know from my own working Cocker Spaniel, Pickle!). With some work to teach him a better alternative, his jumping-up should be much more easily addressed. Henry is a Miniature Bull Terrier. One source describes the breed as ‘Playful, Even Tempered, Energetic, Stubborn, Courageous, Loving’. Energetic, loving and courageous Henry certainly is. Even-tempered he’s not. He is very quickly aroused whereupon he then becomes demanding. Anything that works him up starts him off barking or pestering for attention. Not getting the attention he wants leads to him becoming quickly frustrated then angry. He may grab their ankles when things are not going his way. More recently he has bitten two people quite badly. I was very nearly the third. I have only visited a few dogs that start off very friendly and interested in me, if in an over-excitable way, but whose arousal then gradually escalates into something else. Instead of calming down, as the minutes went by the more aroused Henry became. I believe he may not have liked being ignored. I wouldn’t normally be touching a dog when I enter his house but would wait for calm. Being left to make his own decisions was something different for Henry. He is usually held while the person strokes him ‘to calm him down’. I took myself away to a high bar stool at the counter as his arousal levels soared. 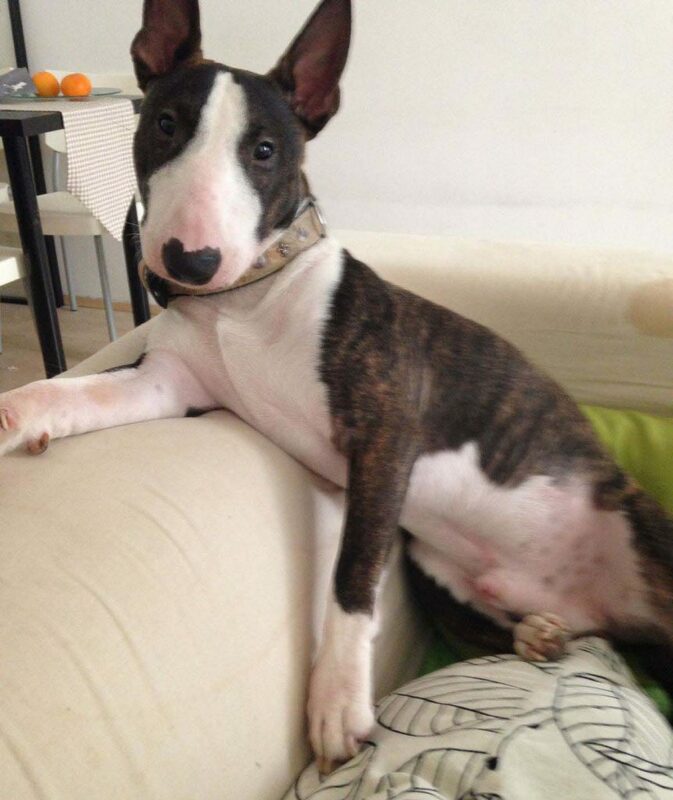 He was flying all over the sofa. We all continued chatting. Henry is difficult to read. His face is fairly inscrutable. He barked at me and then became still. His eyes went hard as he stared at me. I looked away. Then he flew at me. He grabbed my clothes, leaping high to get at my arm (fortunately heavy garments). I sat very still, and quietly asked the man to get his lead. He muzzled him. Thwarted, Henry was in such a state now that had it not been for the muzzle I know I would have been badly bitten. He charged at me several times while I didn’t react before he was put away in another room for the rest of the evening. This ‘attack’ had taken the couple completely by surprise – more than it did myself. 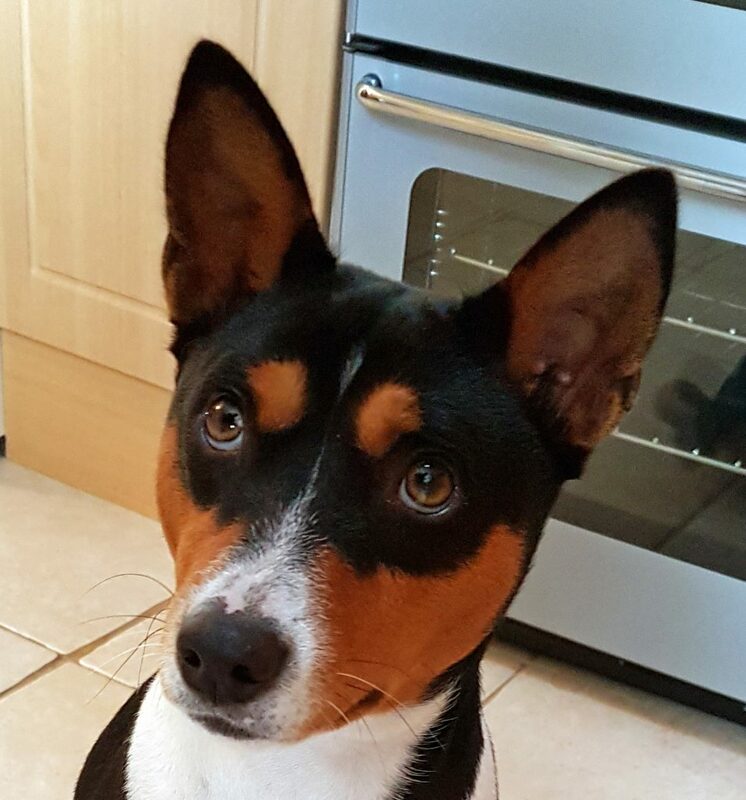 Although he had recently bitten two people and caused injury, it was two different people who had been looking after him while the family was away. It had never happened to anyone in their own house or in their presence. These things tend to get worse with each episode. It has escalated from grabbing their ankles to a couple of serious bites of which I could have been a third. When frustration is making a dog angry, what can you do? The gentleman himself admits that, in doing what he thought was best by copying Cesar Millan’s methods, he may have escalated things when Henry got rough. If a dog is highly aroused and getting angry, the sure way to make him worse is to pin him down or scruff him. Because frustration is causing the anger that is causing the aggression, it’s the frustration that needs dealing with. We need to work on the source. Reacting to the biting itself with any punishment simply doesn’t work long-term. The person who is strong enough to overwhelm and intimidate the dog has always to be on hand to deal with it. It may temporarily put a lid on it but in no way alters for the better how the dog is feeling. The only real long-term safe solution is for Henry not to feel the need for frustration and anger. Of prime importance is for their vet to do some very thorough checks to make sure there isn’t something wrong with Henry to cause the dog to explode so violently with so little provocation. In one way I am pleased he directed the behaviour to myself. They had not been present when he had gone for the other two people and they couldn’t imagine him doing so. Now they have seen it for themselves. They have seen what happens when their loving dog flies into a rage and how little provocation he needs. It’s a good thing they have now witnessed it…. …because they have an eleven-month-old baby who will soon be mobile. Henry has always been fine around the baby, showing no jealousy and not much interest, but the unexpected can happen as it did with me. The couple are now making a little corner of the room into a safe ‘den’ for Henry, somewhere all good things happen and where he’s fed. It’s not punishment because he’s not ‘naughty’. He can’t help it. They will freely use his muzzle when he’s out of his den. They have started doing this out on walks already. It’s a sad situation. The beautiful and well-loved dog is gentle and affectionate most of the time. It’s only when something stirs him up that the trouble starts. They will now do all they can to teach him impulse control and to deal with the normal necessary frustrations that are part of any dog’s daily life. We made a list of the things that get him worked up and many can be avoided. They must get their vet on board for a much fuller check-up and take every practical precaution necessary including the barrier and the muzzle. This is a cautionary tale. As a general rule, it’s best to remain still and look away from a dog that may bite. In the case of Henry, this wasn’t enough. My doing nothing was in itself part of the problem. He wasn’t used to that. Here is an article well worth reading: My dog bit my child today. The young Golden Retriever stops on walks. She sits. She won’t move. When they go to get her, she rolls onto her back. The people I went to see yesterday have just emailed me with something different (Goldie is wary of new things). Their neighbour has had a trampoline erected in their back garden today. Goldie is barking at it – it’s something new that she can see. The lady has been going out with food and the clicker. She is clicking and rewarding many times while Goldie is being quiet but clearly aware of the trampoline. The case of Goldie going on strike is puzzling. Since she first went out at three months of age she would sit down and refuse to move. She was little so they were able to pick her up. Now she’s a fully grown Golden Retriever it’s not possible anymore to lift her when she stops. I would like to deal with this at source too – but where does it come from? There are a few facts: It’s always on the way home that she stops – after exercise. She has an uncanny sense of knowing when they are on the return journey home or to the car. Putting the lead on at random and going a different way doesn’t fool her. Her ears go back and, from the sound of it, I would interpret this as looking scared or wary. Why would this be? The rolling onto her back could well be to appease. I’m assured she’s never been punished for it though there has been a lot of enticing and bribing and exasperation for sure. Goldie is fourteen months old so it will now be well ingrained behaviour – a default response when she feels a certain way. What way is she’s feeling, though? The other day things took a turn for the worse. She had sat down and as usual rolled over onto her back, making it difficult to get her up. The lady grabbed her harness to try to make her move. Suddenly Goldie leapt up and at the woman’s face. It’s happened two or three times within the past few days. The lady is very upset and scared to walk her now. She stops because she doesn’t want to go home (that doesn’t work because she always does go home). Or she stops because, when small, she was picked up and carried and she liked it. She stops because it gives her attention. Or she stops because the arousal previously created in her system from her walk has been too much for her. She stops because after exercise she may be uncomfortable in some way. Each time the only result it’s generated for her is to be made to move. Recently Goldie has started to do other things she used not to do. She has begun to dig in the garden and to hump the lady. She is whining in the night. She was spayed shortly before these things started. Could there be a connection? They visit their vet next week who can check. In the context of the past few weeks there are indications that she has, for some reason, been more stressed in general. She’s a sensitive dog. Something has recently pushed her over the edge. To quote the lady, she’s flipped. Either Goldie has been unable to handle the frustration of the walk coming to an end and has lost her temper. This is what the owners assume and is very likely. Or, just possibly, instead of not wanting something to stop (the walk), she doesn’t want something to start (going home) and it’s scaring her. Her stress levels could come from unexpected quarters, both at home and when out. They could include the fallout from extreme exercise – running free and hunting, being restrained, being forced to do something against her will. Many little things could contribute to the build-up. She doesn’t like the sound of metal on metal, for instance. Although I can so far only guess at the cause, we can create a plan that should be appropriate anyway. Our plan uses stress-reduction as a basis to work on, along with relationship building. We’ll focus on the walker being much more motivating and rewarding. If she wants to be with her humans more than anything else, then she should want to continue walking with them. Walks will be done a bit differently in order to try to interrupt the learned sequence. They will do lots of work walking back and forth near to the house, loose lead, making it fun and with bits of her meal dropped from time to time – but only when in the direction of home. The same thing can then be done on a long line in open places. It may be possible to train her to get up and move if they had sufficient time, using a clicker and rewarding. They would need to click and reward every small movement like rolling onto her front, sitting up, then looking ahead, then sitting higher and then standing – then taking a step and so on. This could take much too long in the middle of a field in the dark or on a busy pavement! However, if they can stop her feeling she needs to sit, roll over and go on strike and prefer to keep walking, they will have dealt with the problem at source. The first few weeks of a dog’s life can have lifelong impact. 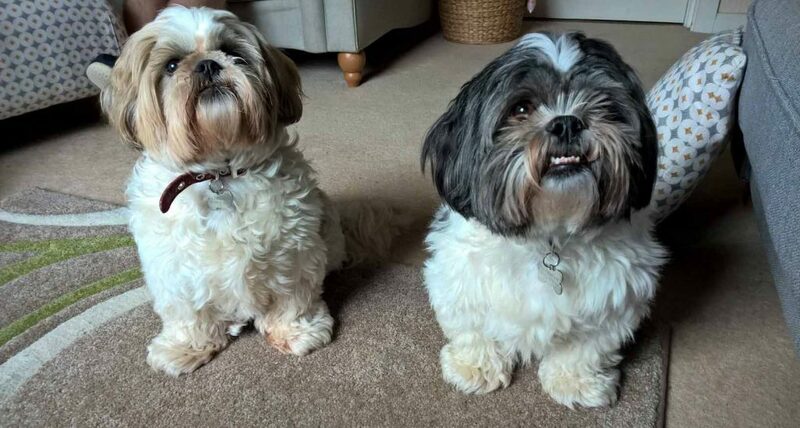 Sally and Pepper are two adorable and friendly Shih Tzus, ages five and eighteen months respectively. They came from different breeders and this is reflected in their general confidence and sociability to other dogs. Sally is quite happy carrying her ball and playing games when out. Pepper, on the other hand, is on permanent alert to sounds….and to dogs. Pepper left his mother and litter a bit early and hadn’t been well cared for, very different to Sally’s start in life. Walks can be difficult for the young lady in particular. She’s actually scared now when walking little Pepper. When held back from attacking another dog, he has redirected his frustration three times now, resulting in bites. It’s easy to assume that this is just something to do with ‘training’ out on walks. I see it as part of a much bigger picture that if they first get all the groundwork in place at home and understand how to approach the ‘other dog’ problem by seeing things through Pepper’s eyes, things should dramatically improve. Pepper will then have no need for frustration. There are two dogs living next door with just a wall between the houses, one dog in particular is very noisy. Barking is heard intermittently throughout the day, upon which the younger Shih Tzu, Pepper, will immediately react and run around the house barking ineffectually, trying to get to the barking dog the other side of the wall. Imagine his frustration at failing every time. This may happen many times a day. Cheeky Sally, too, may give one bark to set him off! Worse, a while ago the two male dogs would regularly ‘fence-fight’ with much snarling and leaping at the fence from both sides. The large dog had knocked down the old fence and his leaping at the new fence has already exposed gaps at the bottom. Although Pepper is no longer free to go outside in his own garden, whenever he is let out he’s on high alert. Even from the kitchen French window he can hear the other dog the other side of the fence, and this room is where he and Pepper are left when they go out. Bouts of frustration will be recurring. So, it’s against this background at home that makes Pepper’s behaviour out on walks all the more understandable. Helping him needs to be approached from three angles. The first is management in order to make Pepper’s environment as helpful as possible – like gating him away from the back window and only letting him out on a lead. The second is to get Pepper to feel differently so that he no longer feels he needs to bark through the wall and protect himself outside in his garden. This can only be done by desensitising and counter-conditioning. We made a start, as you can see from the picture. I took the photo when both dogs were sitting in front of me while noises went on from next door. Changing the emotions that drive him to being so reactive to other dogs also involves reducing Pepper’s stress levels in general so that he becomes a calmer dog. When he’s no longer reacting to the barking through the wall, they can move on to working in the garden. With time and effort they should have him ignoring the dog behind the fence. Without Pepper retaliating, the next door dog will be quieter. What about encountering dogs on walks, though? How his humans behave when out on walks and another dog appears is crucial. At present they hold Pepper tight as they advance on the dog – they may pick him up – and all he wants to do is to get at it. He lunges, snarls and, to quote, ‘barks ballistically’. At proximity he will never learn to feel differently. It’s how he’s feeling that is driving how he’s behaving. Avoiding dogs altogether will get them nowhere, though I do suggest a couple of dog-free weeks to build upon. Why? Then, as with the dogs next door, it’s slow, patient work that is required so he is never pushed beyond his comfort threshold and eventually comes to feel differently about them. 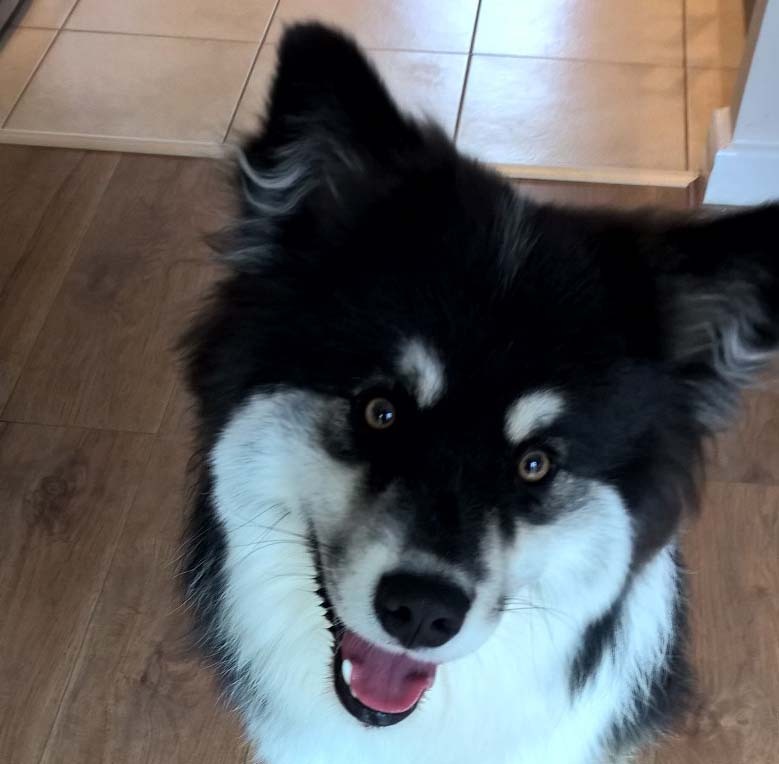 Thirdly, after management and working on changing how Pepper feels, comes teaching him actions that are incompatible with the unwanted behaviour (like ‘sit’, ‘come’, ‘stay’ and so on) or removing himself from trouble if the neighbour’s dog is in their garden. Within a few minutes yesterday, using appropriate harness and lead, they were walking a much calmer dog on a loose lead down the road. Pulling against a tight lead causing discomfort to the neck from a collar is not conducive of a relaxed walk. When he lunges at a dog it will hurt his delicate little neck. From now on, if another dog suddenly appears and they can’t react in time, he will feel no discomfort. He will be taken to what he considers is a safe distance. If they watch him he, he will let them know where this distance is. At this distance the work they will have been doing with the dog next door can be replicated out on the walk. In all areas of Pepper’s life they will do their best to keep his arousal levels down. Stress and frustration go hand in hand. Being on constant alert also means he could well be sleep-deprived, which will not be helping his stress levels either. The ‘stress circle’: barking creates stress and stress creates barking! Stress creates more reactivity to other dogs and reactivity to other dogs creates more stress…. and so on. 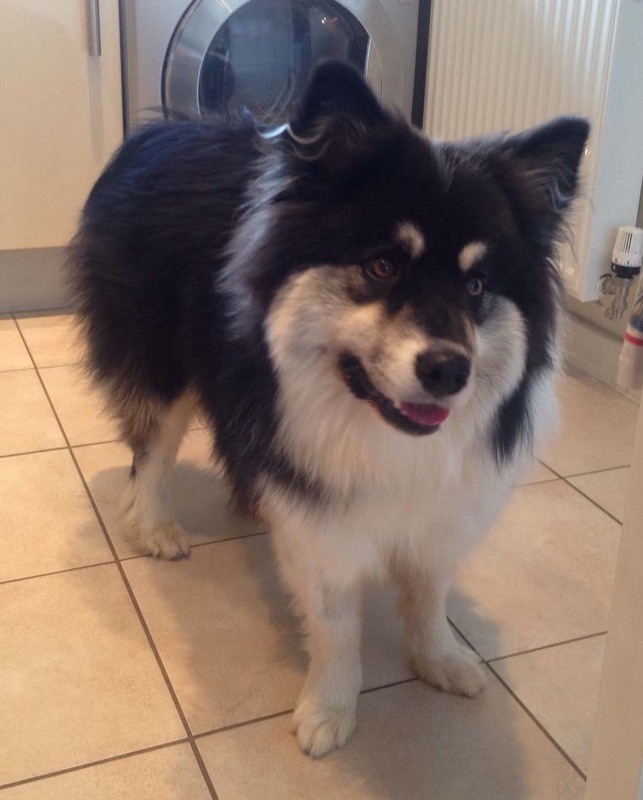 Beautiful Finnish Lapphund Teemu is now nine months old. If things continue in the direction they are going, they worry that either the lady or one of the children will be hurt. So far blood hasn’t been drawn, but if things continue as they are it is only a matter of time. He gave me an excited welcome with some jumping up – no more than many adolescent dogs that I go to. However, quite soon it became apparent just how stressed he is. He paced, he panted, he looked for trouble and he kept barking to be let out, then barking with frustration when the door wasn’t opened. The problem is – CATS. They sit up on the fence, staring down at him as he goes berserk. They come into his garden and stare brazenly through the window at him. All day he is stressing through the French windows over cats. If no cat is there, he is waiting for one. 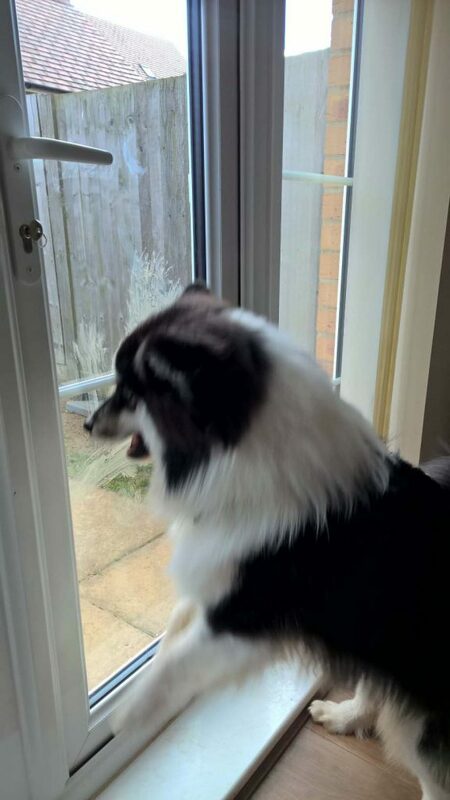 If he sees a cat he would break the window down if he could and the noise of his barking blocks out everything. When he’s let out, even if there are no cats Teemu won’t come back in just in case one might appear. They stay just out of reach, teasing him. Hour by hour as the day progresses he becomes more stressed. Then the kids come home and boom – it’s all stacked up and he explodes. He has pinned the lady to the wall, snarling. Mornings can be over-exciting too. The other day before school he turned on the little girl though stopped short of biting – this time. She was throwing his ball and he lost his temper. He calms down in the evening. At first I thought it may be because the kids have gone to bed, but probably it’s because, when it’s dark, he can no longer see out of the window so he has a break from cat-lookout. Management is the first step and should make a huge difference. I predict that three simple things, nothing to do with training or behaviour therapy, will make a big difference and enable them to make real progress with the work we need to do. Firstly, if Teemu can’t see out of the window he can’t be on ‘cat-watch’, can he. As soon as I left they were going out to buy some plastic window frosting which can go on the lower part of the French windows. Secondly, you can get prickly plastic thingies to put on top of fences that make it too uncomfortable for a cat to sit on the fence. Thirdly, for now when they let him out it can be on a retractable lead – the only good use for one! – the handle perhaps shut in the door. As soon as he barks or sees a cat, in he comes before he has a chance to get too wound up. Teemu shouldn’t be labelled ‘aggressive’. The behaviour is redirected frustration. Down the road from me there are two Boxers left out all day in a front garden. They bark madly when another dog passes and then, because they can’t get at their real target – the passing dog – one Boxer dog goes for the other and it ends in a fight. Why the man lets it happen I really don’t know. This is the sort of thing that is happening with Teemu. He can’t get to his real target so he redirects onto something else, but not something stronger than himself like the very tall man. The lady is petite and the children are small. He has already had some good puppy training and they have used clicker. 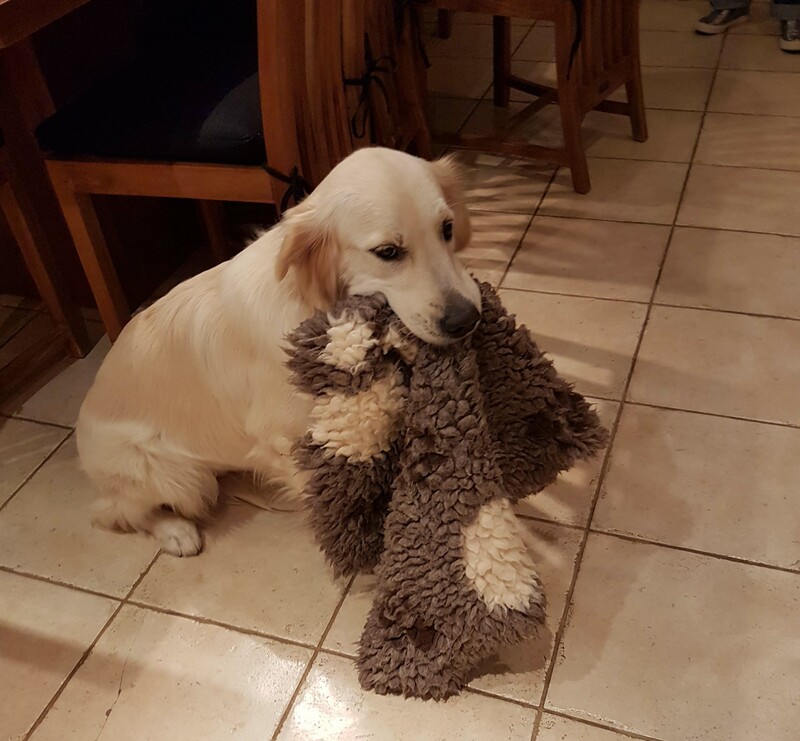 With this his humans can now reinforce the behaviours that they want – all the good things Teemu does. They will work on doing things calmly at certain trigger points – for instance, when people come down in the morning, when their cat is about (their cat stands up for himself and Teemu would like to play), when callers come to the house and so on. If they can drastically reduce his frustration and stress, he will have nothing to redirect. He should become a lot more accepting of things he doesn’t much like – such as being groomed. With management in place, a pot of good food, a clicker, the good exercise he already gets and plenty of patience along with a list of healthy activities that aren’t too arousing, they will win! They will have a calmer dog and a dog that they can trust. I checked to see how they were doing six months after I first met Teemu, and this is the reply: We are doing great thank you. I can’t believe it has been six months already. Teemu has been amazing and incredibly well behaved. He has his moments (as we all do) but they are very short lived. We revert back to your plan to refresh our minds every now and again and even the children are still following your advice. We’re very grateful for your follow up to check how we’re doing, it’s lovely that you still care so much. We have ourselves a lovely, affectionate four legged member of the family and we are indebted to you for all your help. Message to me the next morning: So far so good. The children were brilliant this morning before school and Teemu was just as good. We have had a foraging game in the garden and a packed Kong and he is now relaxing. The window covers are amazing and have had an immediate effect. We cannot thank you enough. There has been no frantic barking either. Later the same evening (day two): Just an update from our first full day of implementing “Plan Calm” (as we’ve called it), and it has been really positive. Today has been the first day in I don’t know how long that Teemu has not bitten myself or the girls. He had a few minutes a couple of times when I had to turn away at his barking but other than that he has been incredibly calm and has responded well to the changes. I know there will be times when he tries to push the boundaries again but today has given me more confidence with how to deal with those times if/when they occur. He is currently exhausted from all the foraging and finding today and is sprawled across our feet fast asleep on the floor! As far as Day 1 has gone, we are thrilled. Huge Thank yous are sent your way. Telephone conversation 5 days after my visit: They have had a great week. No biting. He is a different dog. The children can already move about freely and they, too, are being wonderful. The lady had her best walk ever yesterday with no pulling. It’s like they have found the key. Very pleased. It’s not often that things begin to work so quickly but in this case it’s purely because the dog was misunderstood. Over three weeks have now gone by: Overall, I think we’re doing great! We have a much happier household, the children are confident around Teemu now and have all done incredibly well with not over exciting him. We have not experienced any biting at all since your visit and I feel that Teemu now has respect for us all and not just the males in the family.